On a beautiful day here in Utah, with the sun shining and the birds chirping in the back yard, I heard over the radio of the passing of Hawaii's own, Don Ho. His style and attitude made those who knew him saddened by his passing. As a teenager I grew up with his music, and yes, I know all the words to "Tiny Bubbles." Not only Hawaii, but the world has lost a loved one. Thank you, Don, for music of the heart! It was August 1969, and I was on R&R from my combat tour with the First Cavalry in Vietnam. On our first night in Honolulu, my wife and I went to see Don Ho perform. In the middle of the act, he stopped and put forth a wonderful salute of gratitude to all the members of the armed forces, fighting in Vietnam, in the audience. "Stand up," he said, and then led the audience in a standing ovation to us. It was the only warmth and gratitude most of us would ever experience from our fellow citizens in response to our sacrifice and service. On returning to my division in Phouc Vinh, I was told by all who had seen Don in Hawaii that he did the same thing every night. At a time when spit and "baby killer" were the salutes most of us would receive in the States, and when there were many more Jane Fondas than John Waynes in our great country, it would be very unfortunate if -- along with celebrities and the "entertainment elite" -- those of us who answered the call during contentious times weren't included with those who mourn the passing of a fine entertainer and a friend to the men in uniform who chose to stand and be counted. We stand to salute you, Don. We haven't forgotten. It is with deep sadness that we learned of the passing of Don Ho. The entire Outrigger ohana sends their deepest sympathy to the Ho family during this time of loss. It's been an honor having Don and his musical family as part of the Waikiki Beachcomber Hotel (now the Ohana Waikiki Beachcomber) for the past 12 years. It wasn't unusual to have fans lining the hallway to his showroom waiting their turn to spend just a few moments with him. Don was an entertainer for all ages, with grandparents bringing their grandkids to enjoy his show. Many fans even became friends, attending his show every time they came to Hawaii. 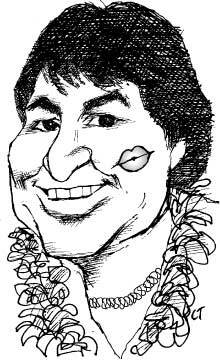 Don Ho was the face of Hawaii to so many people around the world. He was a true ambassador for our islands, and he is going to be missed by one and all. From the hearts of the citizens and music fans of America's first and original "Remember" city (after the Alamo), San Antonio: Thank you, Don Ho and band, for some of the most memorable moments of our lives. R.I.P., brudda! Rest in Polynesia. I enjoyed Michael Egan's article about recently published books set in Hawaii ("Murder they wrote; 'Hawaiian' novels, not!" Star-Bulletin, April 15). And I understand his frustration that the four books he mentioned, which included my mystery novel "Right from the Gecko," were all written from a visitor's point of view. But that's the problem with living in paradise. Visitors are bound to come to your beautiful islands and fall in love with them. And then, after we return to the "real world," where the only palm trees are in pots and sunsets come alive only on the postcards we brought home, the best way of clinging to our fond memories of Hawaii is by setting our novels there. I think that Mark Terry's idea of curbside recycling is really messed up ("Forget recycling; build a new island with trash," "Letters," March 28). To me, curbside recycling is a small solution to our garbage problem because if you choose to throw a can away, you choose to make a whole new can. But when you recycle you are still using the same material. You're just reusing it. And when it's time to sort out all of your cans and bottles, who cares if it takes you a little while? You'll feel socially responsible, and you'll know that you're making a difference. I also think that Mark's idea of building another Magic Island to hold our trash is a bad idea. After a while our trash will begin to smell horrible, and the smell will continue to linger in the air. It also might disrupt the tourists on the beach and will cause them not to visit Ala Moana Beach anymore. I'm amazed that someone could even suggest to "Give physicians a break on state income tax" ("Letters," April 13). The ones who really need it are those below poverty level, those who can't afford a roof over their head or feed their families, definitely not rich physicians, no way! If you take better care of your own health, like eating plenty of fruits and veggies, exercise regularly, practice caution in traffic, don't drink or smoke, there is less likelihood you will need a physician. I haven't seen one in a very long time, and I'm in my late 50s. If doctors want to earn even more somewhere else, let them go, but don't heap more riches on these well-heeled folks. Has anyone noticed how just about all of Mayor Mufi Hannemann's solutions involve increases in fees or the raising of taxes? Tax and spend. Think about how much less you paid to get your car or truck registered before Hannemann became mayor. About half of what you pay now? Any relief in property taxes? There will be no real relief if Hannemann has his way. The largest increase ever at one time in excise taxes? For the mayor's personal monument to himself, a rail system that will not decrease traffic congestion according to every meaningful study ever done. A system that won't even benefit the people of Ewa Beach. A rail system that has not worked anywhere else it has been tried. Few, if any, rail systems have reached their projected ridership or come in at budget. Let's name this project "Mufi's Folly." After reading about the shootings yesterday at Virginia Tech, I couldn't help but wonder, why is it when something like this happens at a school, it's such a terrible thing, yet if this had happened at a post office, everyone from late-night TV to sitcoms to movies to people on the streets would have a good laugh about it? Maybe instead of calling it "going postal," we should call it "going school"! But neither one is very funny, is it? How can we stand up to others' indecency? This letter is to the man I saw Saturday at a track meet at Kaiser High School -- the one wearing the T-shirt that said in big bold letters "Represent MotherF----!" I leave the last part blank because I don't talk like that, nor do I want my children to hear or see language like that. Fill in the blanks with the worst thing you can imagine, and that is what hundreds of people were subjected to in the name of free speech. This kind of thing is not unusual anymore, unfortunately. Just look at the bumper stickers on some vehicles today. In the name of free speech, we tolerate public indecency. Radio host Don Imus lost his job for deplorable speech. Shouldn't this man at least have been denied admission to an event at a school where people of all ages (especially children) were subjected to profanity? We don't even know how to stand up to these people these days. I am a female and on the smaller side; he was a rather robust, strong-looking male. I am ashamed to say that I was intimidated and didn't do anything. Others around me agreed that the shirt was offensive but were reluctant to do anything about it. When I went to an official at the meet to ask if anyone might speak to the man, the official didn't know what, if anything, could be done. Where have all the decent people gone -- are we all just too scared to stand up to the bullies anymore?